Usage/Application: Suitable for home school office personal gifts souvenirs and other occasions. 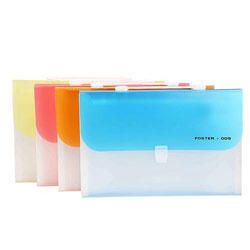 Owing to the sound industry experience, we have been successful in catering to the requirements of our esteemed clients by offering quality Translucent Expanding File. We offer colorful range of files with in order to meet the requirements of clients. Our offered files are ideal for storing documents and other important agreements. Mehta Hwa Fuh Plastics Pvt. Ltd.
- 12 section pockets to store your documents. 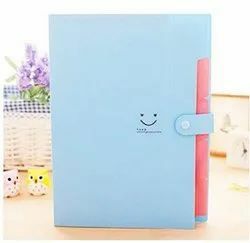 - Highly expandable A4 size pockets. - Insert able index tabs for easy identification. - Elastic closure for locking purposes. It is applicable for keeping the documents for personal and professional use in offices, colleges and schools. With vast industry experience, we have gained competency in offering a wide range of Office Expanding File. Double colour expanding file having metalic colour and good quality of handle and lock.It is having 12 compartment inside. Reckoned amongst one of the notable firms, we are keenly betrothed in providing Cheque Book Size Expanding File. We manufacture conference Files and provide wholesale Conference Plastic Files and Document Files in Chennai. We can print or emboss your logo and name of your company on the Files. We are wholesale Supplier, Manufacturer and Distributor in Chennai., Tamil Nadu. - Expanding File with Handle & Lock Type and Plastic Closure Type. - FL01 : Elastic Closure. We Offer Customized Eco Friendly Expandable Files. We, Padma Marketing, are a reputed manufacturer, trader and Supplier of high quality Button Folders, ID Holder, Pencil Sharpener, Plastic Eraser. These folders are aesthetically appealing and long lasting.